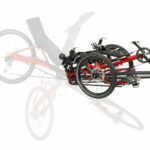 BRC: A fs 26″ trike equipped for off-road adventures! 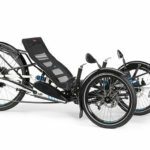 HPV: Trail riding on three wheels: that gave a thrill to trike fans all around the world – and it convinced the jury of the Eurobike Award so that the “Scorpion fs Enduro” was awarded in 2013 for “particularly innovative design and outstanding product quality”. 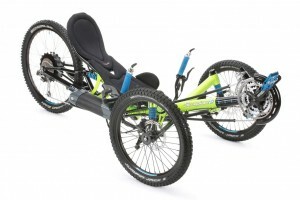 With Forest Lightning and its eye-catching metallic green design we are going to check out new trails. 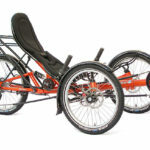 With full suspension and due to technologies from the automotive construction sector it will bring to you yet unknown pleasures while riding in the outback but as well it invites you to delightfully cruise on nature trails. Watch out for our test pilots riding the Taunus Mountains next to the home of HP Velotechnik in Kriftel, where the off-road trike was constructed.